Capacity – 10 yards compost, 15 yards mulch, 8 yards amended soil. Good for home deliveries and tight access situations. These trucks can carry two different materials as well, but the total quantity is limited to a combined 8 cubic yards maximum. Split-loads have a surcharge of $10.00. Capacity – To 100 yards of light mulch, 60 yards heavier mulch, 45 yards compost. Ideal for delivering large amounts of material to areas where tight access is not a problem. Material unloads out the back via moveable floor or belt. 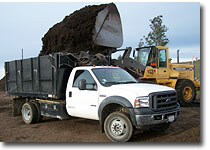 Sonoma Compost will be happy to arrange delivery of your compost, mulch or amended soil. We use several local truckers that give our customers friendly service and fair prices. (Note: Although we arrange the trucking for you, we make no money on the delivery of your order). An Important Note: The cost per cubic yard of delivered material is minimized by ordering in full truckload quantities, since hauling costs are the same whether A truck is half-full or loaded to capacity. Although we can usually schedule deliveries within a day or two, lead times can be longer during our busy spring and fall seasons. For this reason, we advise customers to order early to insure materials arrive when needed. There’s No Such Thing As Free Delivery! 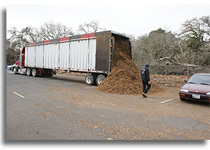 At Sonoma Compost, we’ll do everything possible to minimize the expense of getting material to you, including loading your own truck if you wish. 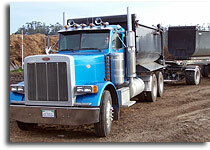 All trucking charges are based upon time and distance. Although you may see free delivery advertised elsewhere, common sense will tell you there is no such thing. There are real and significant costs involved with trucking bulk materials, and these costs are obviously included in the cost of material if no delivery charge is made. When buying any soil product, it’s important to determine the total cost per cubic yard of delivered material, including sales tax and trucking. We invite new customers to visit our yard and demonstration garden to view our materials first hand. If that’s not possible, you can order by phone (707) 664-9113. We’ll be pleased to assist you with your material selection, and help you determine the amount you’ll need.